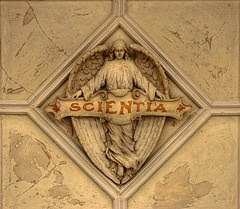 Welcome to the 35th edition of Scientia Pro Publica, a bi-monthly blog carnival covering science, medicine, the environment and technology. I am pleased to host Scientia here at Kind of Curious. For this edition, I decided to organize the blog posts according to the Logic Complexity Pyramid presented by Prakhar in his blog Subterranean Homesick Alien. This pyramid places the most logical science of all, mathematics, at the top of the pyramid, the “hard sciences” such as physics which can be derived from mathematics next, then the social sciences, and finally the most complex of all, philosophy, at the base of the pyramid. I planned to explore the question posed by Prakhar, of whether you can pass up and down the Logic Complexity Pyramid in either direction, deriving each field of science from the ones above or below it. I would organize the Scientia carnival the way science itself is organized, using logic! After thinking about this for a while, my head started to hurt. So I decided to just organize the blog posts alphabetically. In fact, since Subterranean Homesick Alien happens to be last in this alphabetical order, and I have already discussed it, why don’t we go with REVERSE alphabetical order? That would make Southern Fried Science next. Join David as he takes a fascinating look at the history of early American marine biology, focusing on Louis Agassiz. Agassiz was a Swiss scientist who emigrated to the US in 1846, where he continued the prolific career he had begun in Europe. Agassiz is best known for founding the famous Museum of Comparative Zoology at Harvard University. Bec at Save Your Breath for Running Ponies presents some interesting zoology of her own, concerning the Black Lace Weaver spider. Skip this if you are faint of heart. These spiders eat the eggs of their siblings, and then proceed to committing matriphage (eating their mother). Kids these days have no respect for their elders! Next, Bob O’Hara sends along a link to a post by Chris at Prerogative of Harlots. This interesting piece looks at the thought process of developing a museum exhibit. What is the best way to explain to the public that despite “global warming“, it is actually much colder now than it was at the time of the Paleocene-Eocene Thermal Maximum (PETM) 55 million years ago? Most importantly, the high temperatures back then were also the result of greenhouse gases. Although some animals evolved to live in both extremes of temperature, there is no guarantee that humans will be one of those animals. Isis the Scientist contributes an inspiring story on her blog On Becoming a Domestic and Laboratory Goddess… She was definitely a laboratory goddess this day, as she made the light bulb come on over the head of a student. If you are like me and would not be able to tell the difference between an artery and a vein, check out her easy-to-understand explanation. Over at Ninjameys, Thonoir continues his alternative listing of Endangered Species. Thonoir’s list is based on how critically endangered the species actually is, rather than some other lists that seem to be based more on the cute and cuddly factor. This list is Arthropods Part 1 - Arachnids, Crustaceans and Millipedes. I’m glad that someone cares that there are millipedes going extinct. Speaking of extinction, Mike The Mad Biologist brings us the disturbing news that one of the finch species studied by Darwin appears to be on the brink of extinction. It is already gone from 2 of the 3 islands that Darwin studied it on. The last island has only 2 separated populations, one with less than 100 individuals, and the other with only 5 to 10. Possibly the only creature closer to extinction is the student that actually reads the scientific papers that their professor has assigned. Grrl Scientist, at Living the Scientific Life, describes a method for motivating students to actually read these papers. Interestingly, it is similar to the model/rival technique that was used to train Alex, the famous African Grey Parrot with a vocabulary of 150 words. OK, no more extinction jokes. Next we hear from Lab Rat, about a bacteria that has been genetically engineered to remove atrazine (an herbicide pollutant) from the environment. More importantly, these bacteria actually MIGRATE TOWARD the atrazine. This feat was accomplished by selecting bacteria based on the function of their CheZ genes, which control motility. Moving from artificial selection to natural selection, John at Kind of Curious (that’s me!) explains how the Haleakala Silversword plant has adapted to its harsh environment on top of Mount Haleakala in Maui. Greg Laden at Greg Laden’s blog has finally put the nature/nurture debate to rest - at least as it relates to the oyster-catching abilities of Oystercatcher birds. Catching oysters can be deadly work, with the ever present danger of drowning. Conveniently, the beaks of Oystercatchers do not mature to a point where they can use them for catching oysters, until the birds are old enough to have learned the proper methods by observing their mothers. Nature and nurture, working together for the benefit of the Oystercatcher! From bird’s beaks to bird’s feet, we have them all covered in this carnival. Arvind Pillai at Fins to Feet explains (with the help of some great diagrams) how dinosaur feet have evolved into bird’s feet. Over at the Dr. Shock website, Walter van den Broek describes a study of the calming effects of chocolate. Study subjects who were given chocolate with an increased amount of the naturally occurring ingredient y-aminobutyric acid (GABA) showed reduced stress levels while taking a math test. GABA is known to affect neurotransmission in humans. Grrl Scientist sends along a link to Blogging the PhD, by Erika Cule. Erica explains a study in which students performed better on reading comprehension tests when the photos accompanying the text were of professionals of the same gender as the student. When both males and females were shown in the photos, the performance differences disappeared. Brendan Locke at The BioNode describes a recent hike in the Ma-le’l Dunes of Humbolt Bay, CA. He shows the difference between the biodiversity of dunes where invasive species have been removed vs dunes that are dominated by invasives. He provides links to information on how you can help combat invasive species in your area. Julia at Bioluminescence explains the science behind her attempts as a PhD candidate to marry population genetics and skeletal morphology. At “Are You SciCurious?”, SciCurious describes the role of the p53 protein in creating the types of tumors that increase in frequency with age. The functioning of p53 decreases with age, so the ability of a cell to respond to a stressor such as radiation also decreases with age. At the Agricultural Biodiversity Weblog, Jeremy Cherfas and Luigi Guarino explain that a certain variety of cassava known as “bitter cassava” has high levels of cyanide which must be removed through post-harvest processing. Although scientists know how to create “sweet cassava” without high levels of cyanide, these varieties are more susceptible to insect pests and to theft. The moral of the story is that “modern science” needs to take into account the needs of the local community when it comes to tinkering with their food supply. Finally, Andrew Bernardin at the 360 Degree Skeptic provides 2 posts. The first compares the sensationalistic headline of a science news story to the more prosaic statistics contained in the body of the article. Andrew uses this as an example of how science writers need to present science as an ongoing search for truth, rather than “dumbing down” science to be a creator of truths and facts. Andrew’s second post is a tongue-in-cheek look at a recent study claiming that inactivity may not necessarily result in obesity - possibly it may be the other way around. At some point the correlation/causation debate needs to give way to common sense. Well, that's it for Scientia Pro Publica #35. Scientia #36 will appear at The Allotrope on August 2nd. Please send your submissions to The Allotrope or via the Scientia Pro Publica blog site. Also, please consider hosting Scientia Pro Publica on your blog site. Hosting dates are available from September 13th to the end of the year. See the hosting calendar here. If you would like to host, please send an email via the Scientia Pro Publica blog site. Finally, don't forget to visit the Scientia Twitter site and the SciNat Blog Carnival Twitter Site. Thank you both! @Jeremy - Yes, unfortunately the reverse alphabetical order put you near the end. Sorry! Thanks for including my post, John! Lots of great reads here. This is awesome - although I couldnt spot any Physics-related posts in the line-up. And yes, I know you can't be blamed for that! Just an observation. Thanks to all. I enjoyed writing the carnival, and I'm glad you enjoyed reading it!